Microsoft Power BI strives to connect you to the data that matters most to you, whether that’s Excel spreadsheets, on-premises data sources, cloud services or even web tables. Late last year as part of the December Power BI Desktop release, we launched a new connector for data.world – aka the social network for data nerds. data.world is a platform where people can find, use, share and collaborate with a vast array of high-quality open data. The platform is secure, respecting privacy of sensitive data, so that users can decide to share their data publicly or privately with select users under their control. Think of data.world like a social network, where you can converse, add context to data and collaborate with others (but only if you want to). With access to tens of thousands of open datasets spanning all sorts of subject matter, the new connector helps you go from data to insights in minutes. And you’ll never have to worry about having the latest and greatest data, because the data connector syncs directly with data.world, so that you’re always using the freshest data. Join us for the upcoming webinar on February 22nd that explains more about this! Skip ahead to the webinar registration here. First, you will need to sign up for a data.world account (free or paid) to use the connector in Power BI. Once you have a data.world account, you can browse the site for interesting data sets. When you’ve located a data set you’d like to explore or analyze with Power BI, take note of its URL, which is comprised of an Owner and Dataset ID. In this case, the Owner would be associatedpress, and Dataset ID would be foreign-exchange-rates. 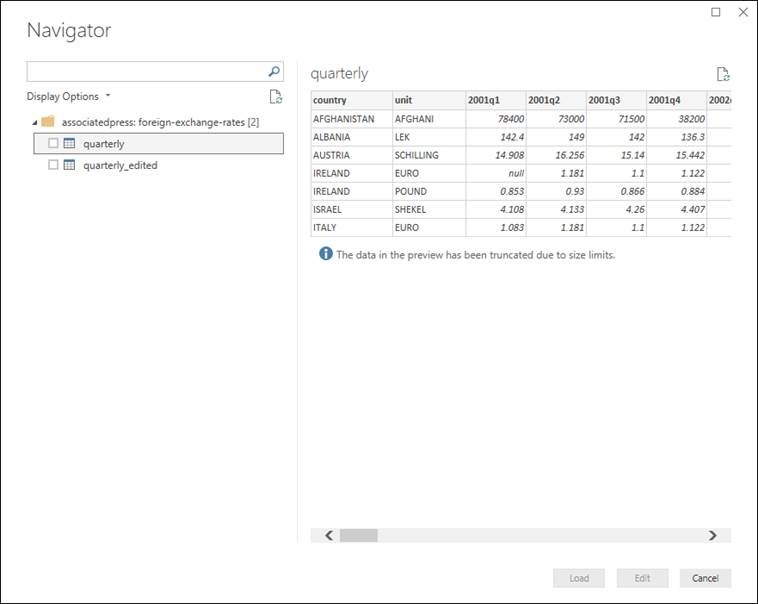 Note: the connector supports Power BI Desktop December 2017 release or greater. Don’t have it yet? Download Power BI Desktop for free here. 1. Open Power BI Desktop. 2. 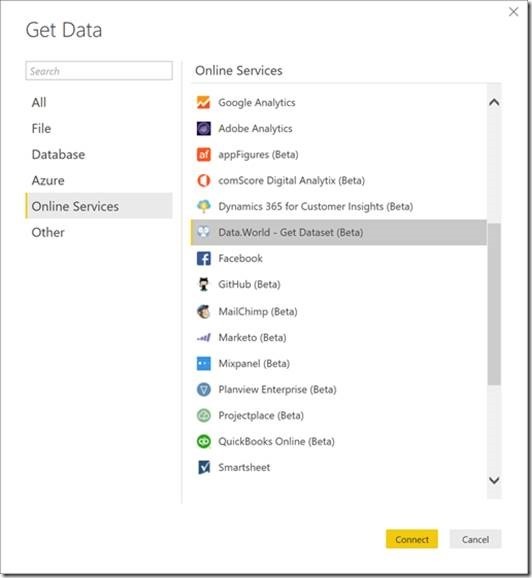 From the Get Data dialog, select Online Services, and then Data.World – Get Dataset (Beta). 3. On the connector prompt, enter the Owner and Dataset ID values from data.world (outlined above) and click OK.
4. The first time you connect to data.world, you will be prompted to authenticate with the service. The connector provides two authentication options – OAuth v2 (recommended) and API Token. 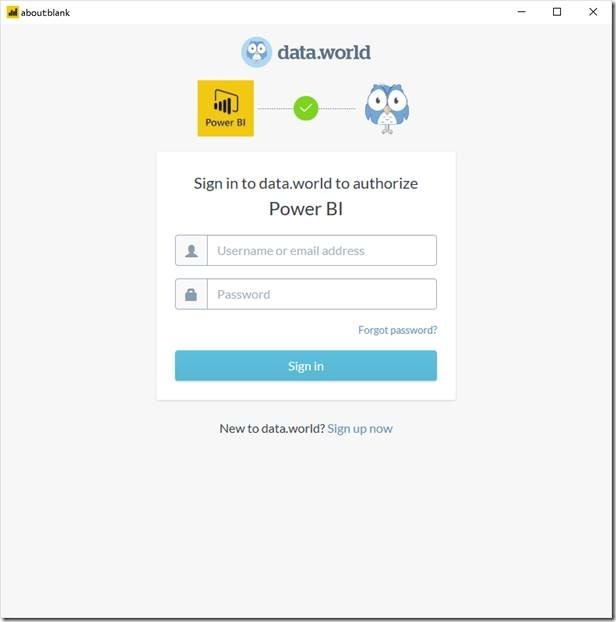 By clicking the Sign in button, a dialog box will pop up asking you to enter your data.world credentials and authorize the Power BI application. This authentication method uses a fixed API key associated with your account, which you can find on the data.world site. You can locate your API Token on the Advanced page of your Profile Settings in data.world. Copy and paste your Read/Write token into the Account Key dialog in Power BI. 5. After providing your data.world credentials, the Navigator window will list all tables/files within the dataset. 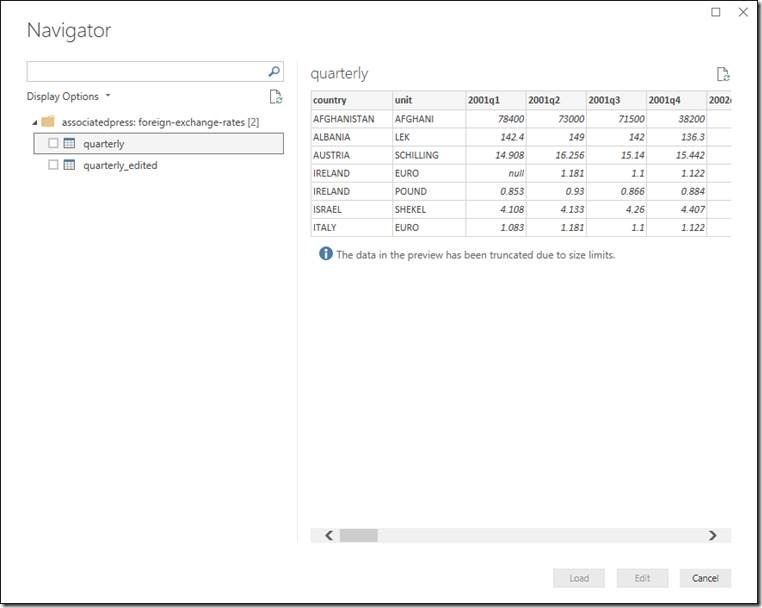 Selecting an entry will display a preview, which you can load into your Power BI model, or click Edit to bring up the Power Query Editor to further refine and shape the data. For example, the Foreign Exchange Rates data set is pivoted, which is not ideal for analytics. 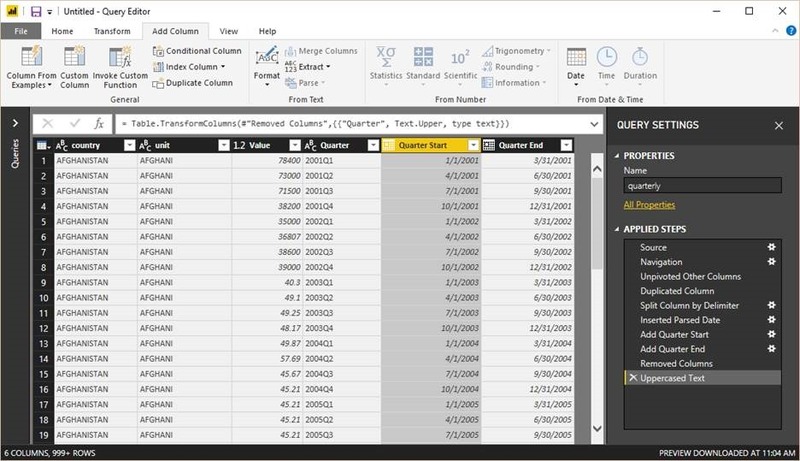 By editing the query, you can quickly unpivot the data and add some simple date calculations, leveraging Power BI’s built-in support for Date/Time visualizations. From here, it’s business as usual with Power BI Desktop. You can clean, model, visualize, and explore your dataset. Check out the Power BI Guided Learning resources for more. Once you have built your Power BI report, you can publish it online, and even add it to your blog or website. 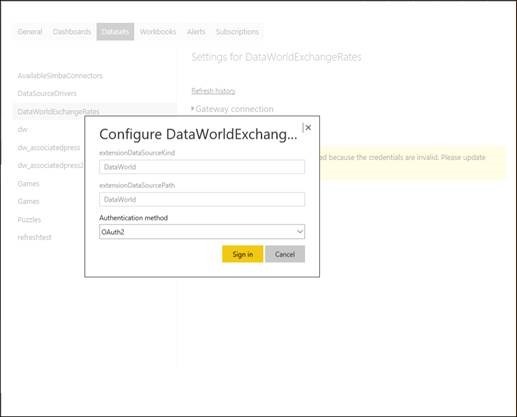 Publishing your report to the online Power BI service will allow you to configure a scheduled refresh for your data.world queries. 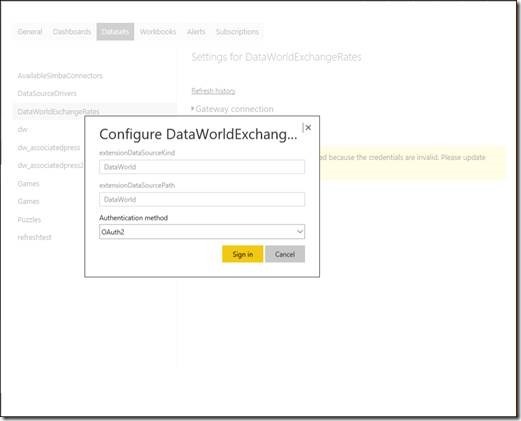 To publish to the Power BI service, follow these instructions. 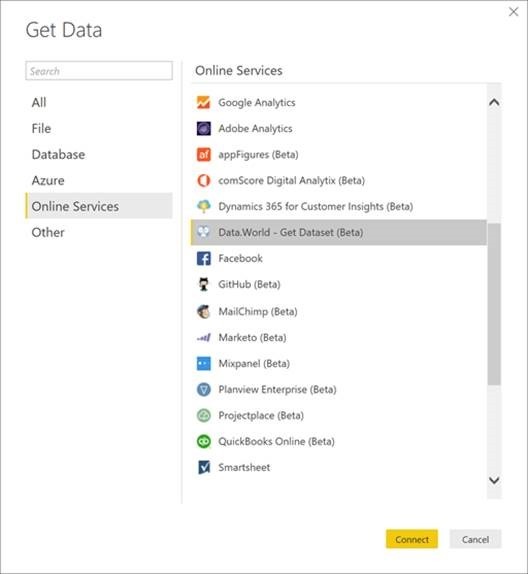 If you don’t already have a Power BI service account, you’ll need to create one (it’s free to sign up). 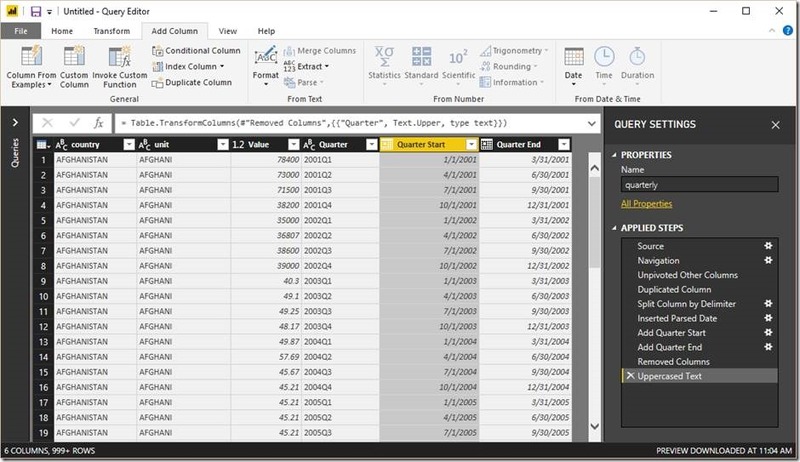 After publishing your report to the Power BI online service, you can configure scheduled refresh for data.world queries. Check out the Configuring scheduled refresh page for more information. Want to share your report on the web? Once your report is published in the Power BI service, you will have the option to make it public. When you publish your report, it will retain all its interactive functionality so users can still filter and interact with the visualizations. It can also be embedded into your website with the generated embed code that can be resized. Follow these instructions to learn how to create this embed code and publish the report to the web. Bonus! If you want to share your insights back to the data.world community, you can use the Power BI report URL to add to a project on data.world. Join us for a webinar on February 22, 2018 at 10am Pacific. Register here. Registrieren Sie sich unten, um aktuelle Mitteilungen zu Power BI zu erhalten. Durch Klicken auf „Jetzt registrieren“ stimmen Sie zu, dass Microsoft Ihnen im Rahmen des Power BI-Newsletterprogramms exklusive Neuigkeiten, Umfragen, Tipps und Tricks sowie andere Informationen bereitstellt, damit Sie Power BI optimal nutzen können. Sie können Ihre Zustimmung jederzeit widerrufen. Datenschutzbestimmungen von Microsoft.